As seems to be the norm lately, Gawker was hacked and taken down this weekend by a group with loose ties to 4chan, the Internet equivalent of a pirate island. All Websites under the Gawker Media brand–Lifehacker, Gawker, Gizmodo, Jezebel, io9, Jalopnik, Kotaku, Fleshbot, Deadspin–were affected by the attack as well. 1.5 million usernames and passwords were compromised in the attack. After taking over the Gawker site, the hackers who call themselves “Gnosis” published the passwords of site staff members and published a long list of users whose password was “password.” Having a good time, the hackers shared bits and pieces of Gawker’s custom CMS source code as well. Below is a quote from one of the hackers, posted on Mediaite. While initially denying the attack, Gawker has issued an apology to its users on all of its sites, urging them to change their passwords because of the attack. Though passwords were encrypted, simple passwords (such as “password”) may be cracked by group, which has a complete copy of the entire account database. 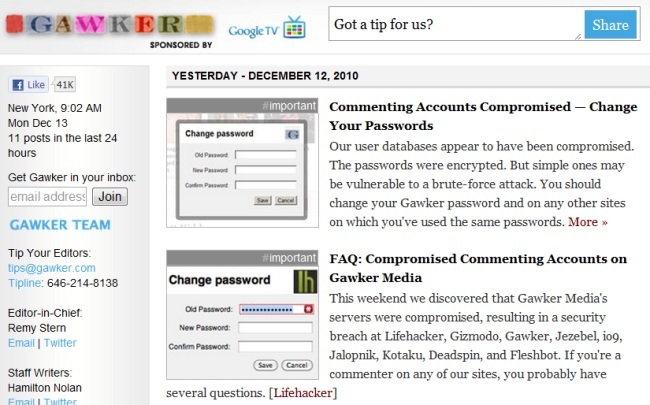 If you have ever commented on any of the Gawker sites, we recommend that you go and change your password. What do you think of this rise of Internet hacking groups? Is it better when hacking is done in the dark or when it’s out in the public like this and Operation Payback?